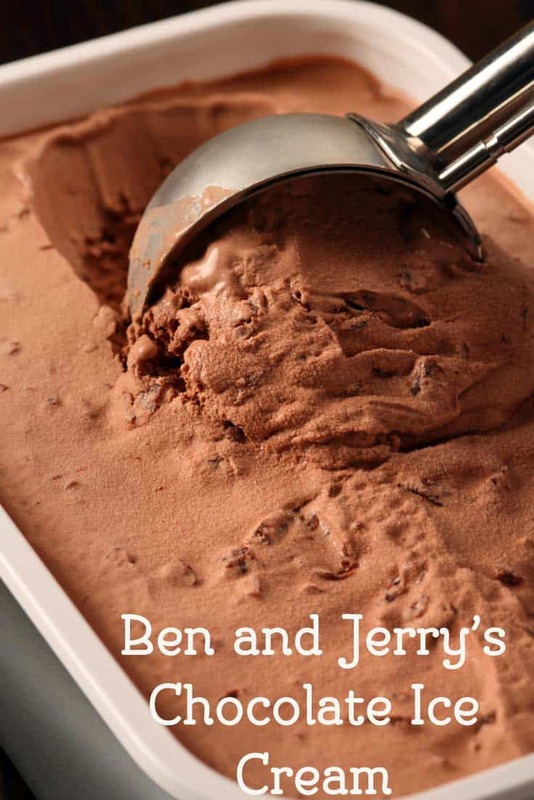 Home » Copycat Restaurant Recipes » Ben & Jerry’s Chocolate Ice Cream – you can have rich chocolaty ice cream at home. Ben & Jerry’s Chocolate Ice Cream – you can have rich chocolaty ice cream at home. It is hard to beat Ben and Jerry’s Ice cream. You can make delicious chocolate ice cream at home. It is hard to beat a creamy and chocolaty ice cream. When you are making it just like Ben and Jerry’s, you know it has to be good. Chocolate ice cream is hard to beat, this creamy sweet treat is well honestly, amazing. This is a simple chocolate ice cream recipe that anyone can make. This recipe is for a machine, as when you make the base of this ice cream it still needs to be frozen. Ice cream makers whip air into the ice cream making it lighter. You can do this as a no churn recipe by simply pouring the ice cream into a container and putting into your freezer for many hours for it to freeze solid. This ice cream recipe isn’t based on a custard so it is easy to put together, you don’t need to cook this mixture before freezing. Some recipes you need to cook the base, then freeze it. This one you don’t so it makes it a lot easier. If you have concerns about raw eggs you should purchase eggs that are pasteurized, these eggs are safe to consume raw. If you like ice cream you may want to check out these recipes. You can have rich chocolaty ice cream at home. In a small saucepan add chocolate and milk. Gradually whisk in the milk and heat, stirring constantly, until smooth. Remove from the heat and let cool.Whisk the eggs in a mixing bowl until light and fluffy, 1-2 minutes.Whisk in the sugar into the eggs, a little at a time, then continue whisking until completely blended, about 1 minute more.Add the cream, vanilla and salt and whisk to blend to the mixing bowl. Pour the chocolate mixture into the cream mixture and blend. Cover and refrigerate until cold, about 1-3 hours, depending on your refrigerator.Transfer the mixture to an ice cream maker and freeze following the manufacturer's instructions.VARIATION: Chocolate Almond- Add 1 cup roasted whole almonds (salted or unsalted) after the ice cream stiffens, about 2 minutes before it is done, then continue to freeze until the ice cream is ready. Best chocolate recipe!!! This will be my 3rd mixture. It’s easy to double recipe to make 4 quarts. Yummy!! I assume the first line should be something about melting the chocolate. I have updated the instructions. They were vague. “Instructions: Gradually whisk in the milk and heat, stirring constantly, until smooth. Remove from the heat and let cool.”…..I think something is missing before this. What do I do with the chocolate? ‘Transfer the mixture to an ice cream maker”? I thought it already was ice cream at this point, why couldn’t you just put it in a bowl or whatever and freeze it? Buying an ice cream maker makes this not very interesting. To get the ice cream to set up, you need to put it into an ice cream maker, you need to whip air into it. If you don’t I guess you could freeze the sweetened milk mixture but you will end up something that is hard as a rock. Herbfell. That is the most stupid Response ever. You thought this was ice cream at this point without an ice cream maker. Seriously? LOL ???? .